Housekeeping Trolley made from high-class steel,full welded structure can stand heavy duty linen. Housekeeping Trolley are designed specifically use for hospitality sector,with cleaning cart easy moving,it quite helpful for housekeeping staff clean guestroom before occupancy. Housekeeping Trolley made in stainless steel,with 2pcs canvas bags in both side for dirty linen,3 levels inside for clean linens,1 amenities tray on top provide storage space to accommodate a variety of cleaning items and disposable supplier,4pcs casters are smonthly on any type of floors.Hotel cleaning cart is designed for easily moving,multi-function and efficient work for housekeeping staffs. 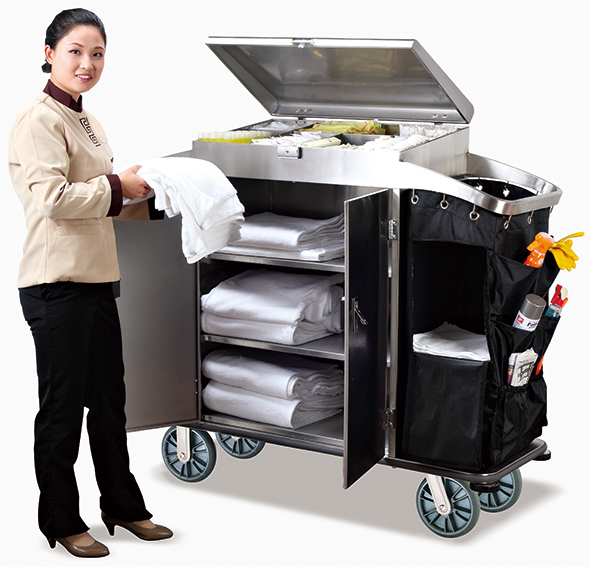 Stainless steel material body make this hotel linen cart durable and stable. Open compartment on hotel maid trolley top for accommodate more disposable products and cleaning supplies. 3 levels inside provide this housekeeping trolley amply saving space for cleaning linens. With water proof canvas bags on laundry trolley both side for dirty linen,also this bags can be dismantled. A rubberised rim around the cleaning trolley base to avoid demage&hit wall during moving. 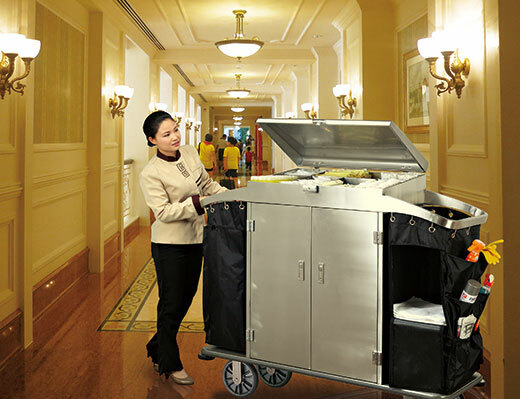 2pcs fixed and 2pcs swiveling wheels on bottom,ensure housekeeping cart silent and confortable pushing. Easily Moving for Cleaning Room 4pcs casters can be smoothly moving on any type of floors. Perfect overall size for passageway and elevator. Related Hotel housekeeping trolley Recommend!